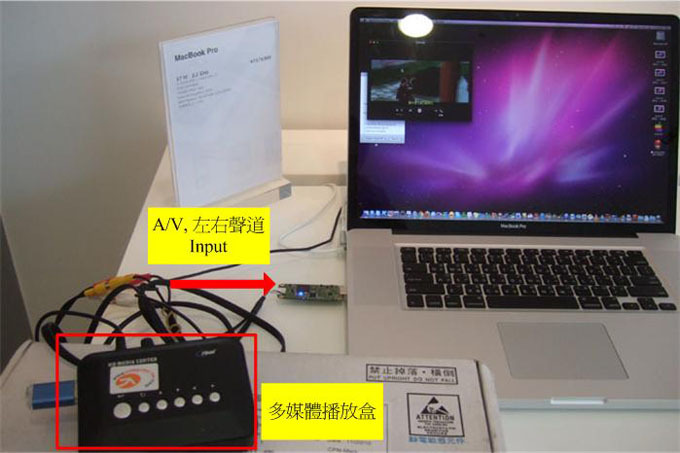 On APPLE MACBOOK (OS X), we can use its internal AP software to see the webcam video. For example, photobooth, ichat and Iimovie. Those are all free. Due to the video conference purpose, photobooth and ichat will auto mirror this video from webcam. I want to find out the AP software that is original video. I do not need auto mirror. Finally, I find the MAC quicktime player can display video without any mirror. I will test my " Driver free UVC A/V CVBS usb card" on the quicktime player. 1. How to open the quicktime player to show the "webcam video"
2. 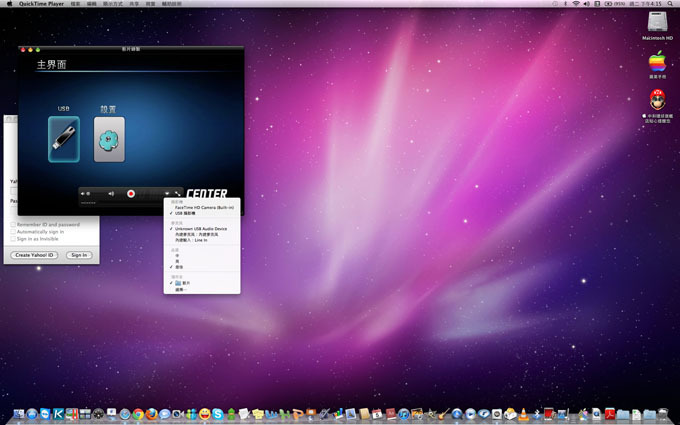 Test the " Driver free UVC A/V CVBS usb card" on the quicktime player. I am very sorry that I am not MAC user. so I went to the apple store to do this experiment. ↓ To open the QuickTime player on the command line. ↓ we can see the webcam video on the macbook. 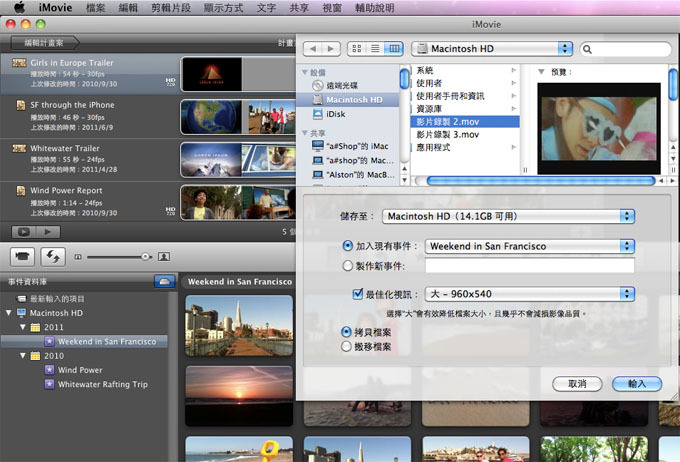 2.Test the " Driver free UVC A/V CVBS usb card" on the quicktime player. Due to the battery on this mackook is empty. So I change to another macbook. ↓ And then, I plug my grabber card on the USB port of mackbook. ↓ I use the media player to simulate the A/V (CVBS) and stereo audio (right/left). my grabber card take the video and audio input. After I plug the grabber card. I DO NOT install any driver.. and we can use the QuickTime player to see the video. ↓ we can see the webcam selection icon "▽" as below picture. 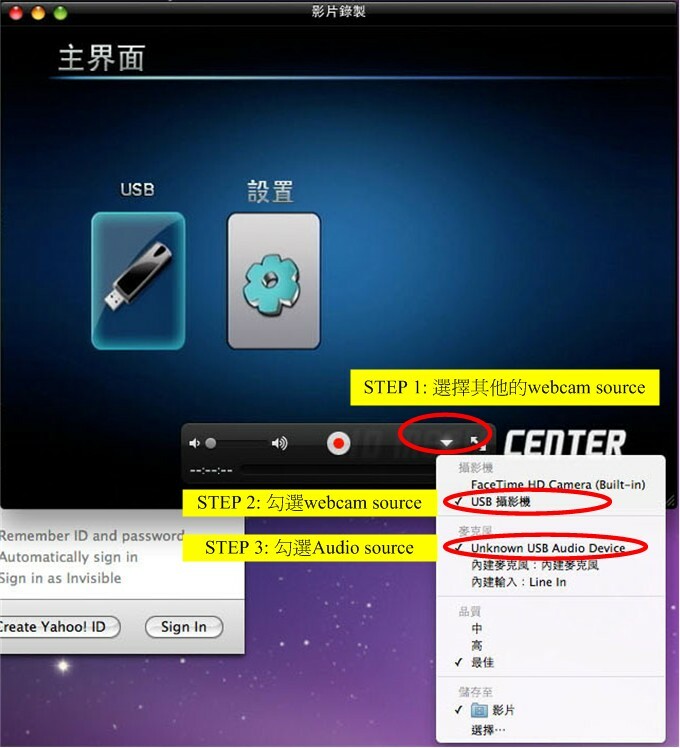 STEP2 choice the webcam source "USB 攝影機(camera)"
STEP3: choice the audio source "unknown USB audio device"
After record by QuickTime player, we can use the iMovie to edit. ↓Open the video clip that had been recorded by QuickTime player. During this experiment, MAC always think my grabber is as "webcam"
If we use this grabber card on the photobooth and ichat, mac will auto mirror the video. Because MAC think this device is as video conference. I also test the Imovie. But this software CAN NOT open the external webcam. I think this garbber card can use on some multimedia application. For example, music software "Arkaos". Arkaos need not only the internal webcam video source bust also extra live video source. You can use these grabber card to do something. For software engineer designer, they can easily design the video application software. They do not to think how to "Vitural webcam"
This "NO driver install UVC A/V CVBS USB grabber card" will M.P on the 2011/08. if you are very interested in it, please contact as below information.